This incredibly funny woman started life as a housewife who dreamed of doing comedy. I saw her on a repeat of Groucho Marx‘s You Bet Your Life show from the 1950’s. As a contestant. Groucho interviewed her and she told of her dream. They used to show that program a lot. 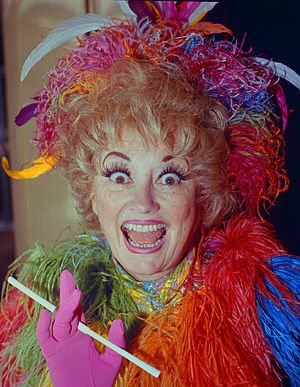 Phyllis Diller worked a lot with comedian Bob Hope appearing in twenty seven of his television specials and three of his films. She also toured with Hope as part of the USO shows that were put on for American GI‘s who were serving during the war. She used to do a lot of cameos for other programs and in films. She very publicly had a face lift and several other plastic surgery operations performed on her when she reached 55. This was worked into her act as well. Her biggest laughs were always at her own expense. One joke she would repeat was her annoyance at the cleanliness of a neighbours home. Phyllis would snort derisively and say”She says you can eat off her floor. Oh Yeah? Well you can eat off my floor. Just look, over there’s the mustard, ketchup over there…” She would then finish with that loud laugh. She must have loved what she was doing. She last worked in 2009 in a video short titled Family Dinner, if you can do the maths, that was three years ago and she was 92. Family and friends say that Phyllis passed peacefully in bed. She was smiling. She has been described as a pioneer. Paving the way for so many other female comediennes Roseanne Barr, Joan Rivers and Ellen DeGeneres. 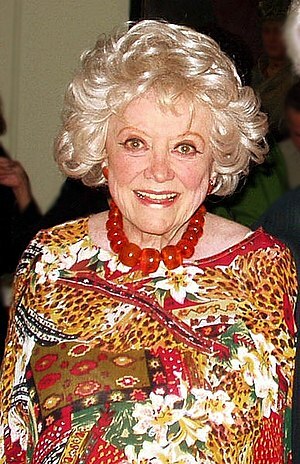 She was the first female to do stand up comedy in Las Vegas. This was a woman who could just walk on stage and immediately put the audience in stitches. She was a legend. So long Phyllis. In a lot of ways you were the party. I hope you’re making the ‘Big Guy’ laugh right now. Oh and say hello to Fang for me.